As he began his professional career, Patrick Weigel had to adjust to typical things: a new level, new teammates and a new city. He also had to adapt to a new inning. In his second outing since transitioning to the starting rotation, the Braves seventh-round pick in this year's Draft allowed one walk over four innings Sunday as Rookie-level Danville took a no-hitter into the seventh in a 1-0 loss to Greeneville at Pioneer Park. "My first start at Pulaski was Opening Day there and it was really exciting, the first inning, definitely. It was just a different experience than what I did in college, especially going from relieving to now starting; it was my first start since February," Weigel said. "Just making that transition and now with my second start under my belt, it's going well." The 20-year-old right-hander was perfect before issuing a one-out walk to Myles Straw in the fourth. Aaron Mizell reached on second baseman Luke Dykstra's error, but Weigel retired Connor Goedert on a fly ball to center field and struck out Randy Cesar to strand runners at the corners. "I relied heavily on my fastball today. It had pretty good life on it, pretty good movement," the University of Houston product said. "Just throwing strikes, keeping hitters off-balance, just getting easy ground balls for my teammates. They played great defense for us today." 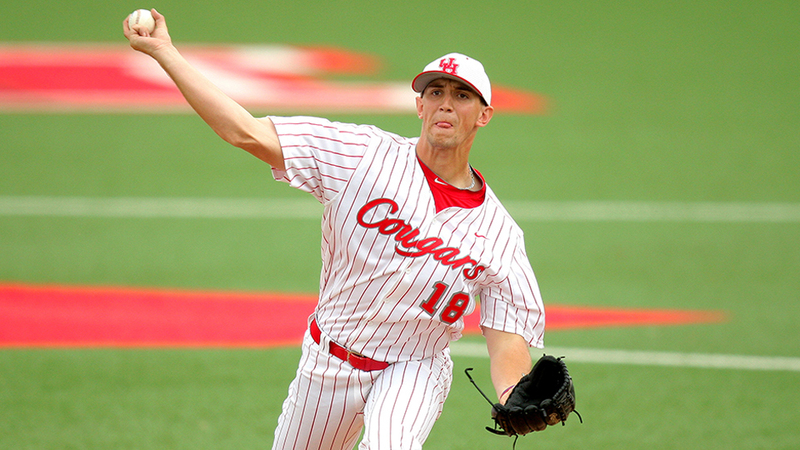 With the Cougars, Weigel made one start in 23 appearances as a junior before the Braves selected him with their 10th pick. He wasn't sure until he got to Danville whether he'd stay in the bullpen or move into the rotation. Since he's become a starter, Weigel has thought back to his year at Oxnard Junior College in California. "It's the same game. You go out and get three outs in every inning, it's just a different order that you do it in," he said. "My main goal is just to go out there and get ground balls for my teammates and get back to the dugout so we can hit." After Weigel exited, Bradley Roney fanned five and walked one to keep the no-hitter intact through the sixth. "We both have pretty similar velocities. Coming in, they weren't catching up to the fastball when I was in, and bringing in Roney after me, he just came in and kept firing fastballs as well," Weigel said. "They still just had not caught up to the velocity yet. So it was a good matchup for both of us today and he definitely kept it going. He was very dominant." One constant during the D-Braves' no-hit bid was catcher Trey Keegan, Atlanta's 14th-round pick this year. "He got a lot of borderline pitches for me and he blocked everything I threw out there. He did a great job tonight as well," Weigel said. "It's awesome anytime you can get a call, it can completely change an at-bat, whether it be a first strike or a 1-1 count, anything you can get a call in your favor." The no-hitter ended when Goedert greeted Daniel Cordero (0-1) with a leadoff single to center in the seventh. Goedert took second on shortstop Kurt Hoekstra, moved up on a wild pitch and scored the game's only run on Brauly Mejia's groundout. "I was in the locker room and I heard the crowd start going and I poked out to see what was going on. I caught it after the fact," Weigel said. "It was definitely a tough one, but that's baseball. You're going to have those days. Just take what we did positive today and build on it and go forth in the season." Astros reliever Ryan Deemes (1-0) worked around two hits over three innings for his first professional win and Zac Grotz pitched a 1-2-3 ninth to earn his first career save.